Private readings are now available at the church with a church medium, but by appointment and arrangement only. 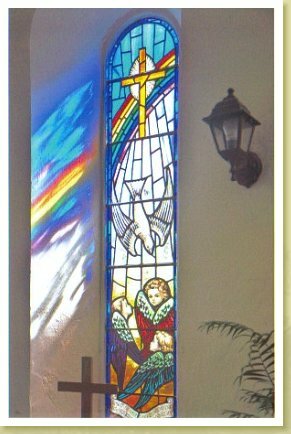 Stained glass windows with sun cast muted rainbow colours upon the walls. It adds to the welcome of this already warm embracing little church. As you enter there is an enveloping energy that brings you peace and tranquillity. We hope you find all that you need. The Christian Spiritualist Church is committed to providing a peaceful spiritual environment - we will do everything we can to meet your expectations. With a variety of events to choose from, we're sure you'll be happy visiting our church. Look around our website by clicking on one of the links on the menu. If you have any comments or questions, please feel free to contact us. Click here. We hope to see you again soon! Check back later for new updates to our website, there's more to come! can burn out your candle.